India v Bangladesh. First ODI. 18-6-2015. Bangladesh earned the acclamation of the saunchest crowd of their country after registering a comprehensive 79-run win against the World Cup semi-finalists. The day and night affair of One Day International cricket between India and Bangladesh turned the fortune in the favor of the hosts at Shere Bangla National Stadium, Mirpur. The first ODI between these two neighbouring countries brought back memories of the World Cup quarter finals. While India continued to play with the same side except Mohammed who is still recovering from an injury and had been replaced by Bhuvneshwar Kumar, Bangladesh made few changes. The latter introduced their 117th and 118th players to play ODIs for Bangladesh. After winning the toss and deciding to bat first, Bangladesh’s skipper Mashrafe Mortaza gave confirmation about the debutants Litton Das and Mustafizur Rahman. India continued with the three-seamers-two-spinners combination and Bangladesh came out stronger with experimentation of four seamers on their side with Shakib Al Hasan handling the spin department. Bangladesh’s innings after winning the toss featured a quick-fire start from the openers Tamim Iqbal(60) and Soumya Sarkar(54) and continuous drizzle that slowed down later on. But in the midst of the 16th over rain played its role and delayed the game almost by an hour, leaving the crowd drenched. A cheer around the ground got louder as soon as the rain stopped and the players came back on. The next five overs took the crowd aback as Bangladesh lost two crucial wickets. One in the form of opener Iqbal and another in the form of debutant Litton Das who only contributed 8 runs. By the end of 20 overs of play Bangladesh’s score board read 129/3 with two new batsmen on the crease. Sabbir Rahman(41) and Shakib Al Hasan(52) combined for a successive partnership of 83 runs. Later, Nasir Hossain and skipper Mortaza added few more runs to push the score beyond the mark of 300 whereas the tail-enders were no good. By the end of 49.4 overs Bangladesh’s innings came to an end and posted a target of 308 for the tourists. R Ashwin’s unpredictable spells helped him to add 3 more wickets in the count whereas Bhuvneshwar Kumar and Umesh Yadav took 2 wickets apiece. India’s innings displayed a disappointing batting performance in front of a raucous Bangladeshi crowd with Rohit Sharma(63) being the only batsman to cross the mark of half century. After a decent start and fall of Shikhar Dhawan(30), the middle order plummeted. With the failure of Virat Kohli(1) and Ajinkya Rahane(9) even captain MS Dhoni failed to launch his assault. After the struggle of few overs with continuous fall of wickets, the partnership between Suresh Raina and Ravindra Jadeja showed a ray of hope and managed to score 40 and 32 runs respectively at the crucial stage of play. The ball of victory kept of bouncing in Bangladesh’s court as soon as India was 7 wickets down. India lost the game by a margin of 79 runs with four more overs to spare. Bangladesh restricted India to 228 runs and displayed a robust ODI game. Debutant Mustafizur Rahman projected an excellent investment of ODI bowling effort that payed him high dividends. His five wickets haul ran through India with his cutter. He successfully registered his name in the record manual, with his figures of 50-5 made him the second ranked bowler from Bangladesh to bag 5 wickets on a debut match with Taskin Ahmed’s 28-5 at the number one spot. Taskin Ahmed’s two crucial wickets of Virat Kohli and Shikhar Dhawan got overshadowed by the debutant’s fifer. The debutant Mustafizur Rahman bagged his first Man of the Match award. Mumbai Indians earned their spurs in the last league match against Sunrisers Hyderabad after producing a show-stealing bowling efforts t/hat lock in the chance in the IPL playoffs. Electing to bat first, both the openers of Sunrisers Hyderabad, David Warner and Shikhar Dhawan failed to make an impression with the bat as they both were dismissed on consecutive deliveries. Dhawan’s off-stump was splintered on Lasith Malinga’s last delivery of the first over, a perfect yorker-length delivery and Dhawan lost the battle against the pace. The next over started off with a loss of another wicket in the form of the in-form and consistent batsman, the leading run scorer of the tournament and the holder of Orange-cap, David Warner. Warner tried to top-edge Mitchell McClenaghan’s short-ball delivery and sends off the ball swiftly into the hands of Kieron Pollard. Sunrisers were reduced to seven for two in 1.1 overs. The two new batsmen, Moises Henriques and Eoin Morgan struggled to rotate the strike and didn’t add much momentum. Another major blow came in the sixth over in the form of Morgan when McClenaghan trapped him into his cobweb of short-ball perfection. Morgan tried to cope up with the short-ball with an upper-cut but was caught at deep by the third man in charge, Lendl Simmons. Soon after he departed, the scoreboard moved from 29-for-3 to 54-for-five by the end of ten overs. Tenth over brought troubles back for the Sunrisers, as back-to-back two wickets Henriques(11) and Naman Ojha(zero) were encountered off Jagadeesha Suchith. 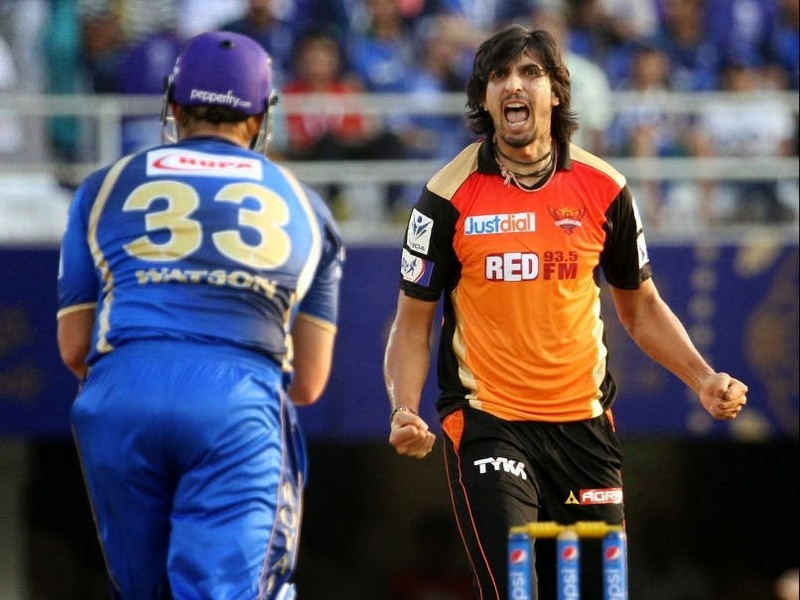 The faith of Sunrisers Hyderabad was shaken as wickets were falling at continuous intervals. Hyderabad’s batting remained their bane as they were restricted by the Mumbai pacers to a paltry 113 for all from their 20 overs. Left-arm fast bowler Mitchell McClenaghan, who took the new ball finished with 3-16 from his four overs and clinched the man-of-the-match award for his effort. Lasith Malinga and Jagadeesha Suchith got two wickets apiece. With a small total to chase and pressure been pulled-off from the back of Mumbai’s batsmen, the openers, Parthiv Patel and Lendl Simmons flourish and ensured that McClenaghan’s three-wicket-haul wouldn’t go to waste as Mumbai completed a below-par chase with 37 balls and nine wickets to spare. While Parthiv Patel belted nine fours and smashed an unbeaten 37-ball-51, Lendl Simmons was unlucky as he was dismissed just two runs short of his half century. The latter made 48 off 44 balls including four boundaries and two sixes. Skipper Rohit Sharma finished off the game by remaining unbeaten on 7. It was a piece of cake for Mumbai Indians served fresh by Sunrisers Hyderabad with a cherry on top as Mumbai confirmed their berth in the playoffs. The hosts paid respect of high order to the visitors. After this win, Mumbai jumped to the second position in the points table with 16 points from 14 games and will play the first Qualifier on their home-ground at Wankhede Stadium against Chennai Superkings on Tuesday, while Hyderabad are no more alive in this year’s tournament. Rajasthan Royals held on by the skin of their teeth to seal a spot in the play-offs after beating Kolkata Knight Riders in a close encounter and the latter just fell short of 9 runs to reach the semi-finals stage. Earlier, after winning the toss Rajasthan skipper Steve Smith decided to put his team to bat first. The team of Rajasthan left no stone unturned and placed their team’s score of 199/6 under the limelight at the Brabourne Stadium. Though it was a batting-pitch and KKR fought back in equal terms but it was Rajasthan who were excelling today. After examining the pitch whick looked greenish, good for batting and seam bowling, RR made three changes. Pravin Tambe, Rajat Bhatia and Ankit Sharma were replaced by Brainder Sran(who played his first game in the IPL), Dhawal Kulkarni and Stuart Binny. Kolkata made one change in their playing XI, they bench Sunil Narine and replaced him with Azhar Mahmood to add some depth in the team’s batting department along with bowling. The opening pair of Rajasthan, the Rahane-Watson-duo helped their to flourish in the first six overs by going the extra mile and giving a dream start by putting 66 runs on the scoreboard. But as soon as the openers pulled themselves together, they ended up in losing a wicket in the form of Ajinkya Rahane, where he was trying to steal another run but Watson smelled the danger and sent him back to the dugout. After Rahane’s 22-ball-37 send off , skipper Steve Smith didn’t spend much time on the crease. He flicked the full toss straight at the short fine leg and the ball landed safely in the hands of Morne Morkel. Every Rajasthan Royals’ batsmen tried to contribute some runs but only Shane Watson managed to thrive brilliantly. He stood till the end on the crease and remained unbeaten. His century of 104 runs off just 59 balls included nine fours and five sixes. With a great total (to chase), comes great load of pressure on the batsmen. As the Kolkata openers Gautam Gambhir and Robin Uthappa stepped in to give an attacking reply to the Royals, Rajasthan brought their in-form and most consistent bowler Chris Morris into the attack to bowl the first over. Morris got his first wicket in that very over and dismissed Gautam Gambhir. Soon fortune had started to favor the Royals as they got another wicket in the form of Robin Uthappa, a major blow to Kolkata. Wrong selection of shot and he was caught at mid-off by Steve Smith. Loss of both the openers and their were two new batsmen on the crease, Yusuf Pathan and Manish Pandey. The partnership started to build between the two, from 21/2 in the third over they accelerated the scoreboard to 77/2 by the end of eighth over. The beginning of ninth over brought another success for the Royals in the form of Manish Pandey’s return to the pavilion. After Pandey’s dismissal, the key player for Kolkata, Andrew Russell came in to bat at number five. The fall of early wickets and failure of of the openers built pressure on the middle-order and this led to continuous fall of wickets. The batting line-up of KKR crumbled in the last 10 overs. But out of nowhere Umesh Yadav showed a ray of hope when he let his freak flag fly in the death overs by adding some runs in the form of fours and sixes. But Royals are the one who are through to the playoffs as Kolkata fell short of 9 runs to reach their dream of making it up into the semifinal stage. Brendon McCullum’s 61-ball-81 and Ravindra Jadeja’s 4 wicket haul helped Chennai Superkings to cement their place in 2015 IPL playoffs by moving on top of the table with 16 points after registering their eighth win. Earlier Chennai Superkings won the toss and their skipper MS Dhoni chose to bat first. Brendon McCullum had been threatening to explode all season with an unbeaten century he scored earlier and fell short of 19 runs to put another century in his kitty today. He scored 81 runs off 61 balls including seven fours and four sixes. 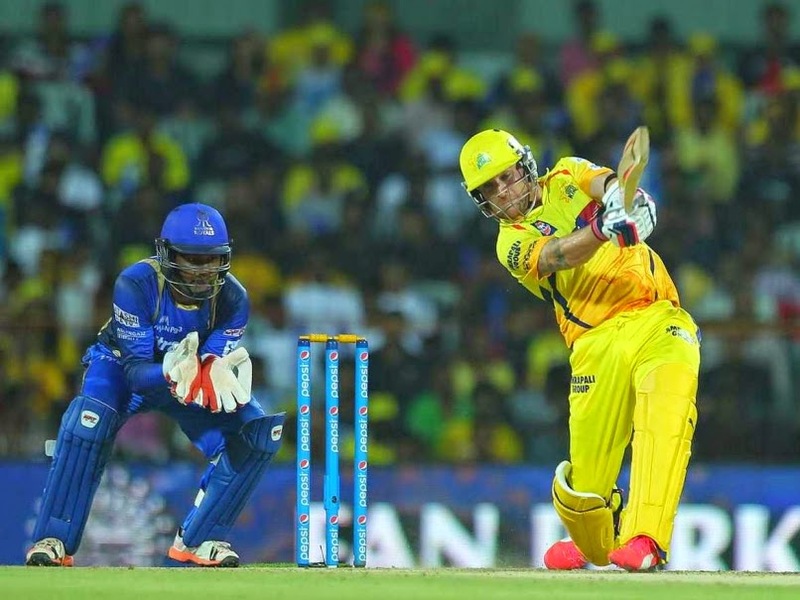 It wasn’t a dream start for Chennai as they were reduced to 17/2 by the end of four overs. Inspite of a trembling start, the fortune favored Chennai and a partnership between Brendon McCullum and Faf du Plessis helped to cross the mark of hundred runs for the team in the fifteenth over. Faf du Plessis was dismissed when he got engaged in a direct hit by Shane Watson, Faf wanted to steal another run but fell short of some inches before reaching the crease-line. The next over followed by McCullum’s send off to the dugout when Ankit Sharma showed no respect to him and took his catch. McCullum’s great effort came to an end off Chris Morris’ ball. Morris who is a former CSK player was the pick of the bowlers for Rajasthan, taking 3 for 19. Partnership between MS Dhoni(11) and DJ Bravo(9) contributed some runs to take the score to 157/7. The captaincy title for the Royals was carried on by Steve Smith today instead of Shane Watson. Steve Smith with his captaincy tactics succeeded to restrict CSK below the mark of 160. But CSK has got many big names attached to their side but gladly the out-of-form Ravindra Jadeja proved his presence in the team today. His brilliant 4-for-11 included two crucial wickets of the Aussies, one of skipper Steven Smith and the other one of Shane Watson. The department where Rajasthan Royals failed today was their batting side where no partnership survived for long. Continuous loss of wickets started to put pressure of the batsmen which they failed to release. Orange cap holder Ajinkya Rahane(23) seemed to have gotten off to a decent start, but fell within a couple of balls to reduce Rajasthan to 31/1 in the midst of the sixth over. Skipper Steve Smith, who came to the crease at number three managed to stand for only six balls. Steve Smith mistimed a sweep and the ball went straight to hit the leg stump and the bails were dislodged from their place. When Jadeja came to bowl the tenth over and bid farewell to Watson’s innings and send him straight to the dugout. Watson tried sending the ball towards the long-off and DJ Bravo pulled off an absolute blinder by taking a one-handed catch and left the crowd in awe. After the end of ten overs Chennai crumbled Rajasthan to 63/3. Despite the top-batsmen getting a decent start, the middle and lower order once again crumbled badly. But even after a fighting reply from the Rajasthan batsmen, the tourist side fell 12 runs short of their target. The host side successfully managed to fix a spot into the playoffs for the eighth consecutive time. The word ‘Consistency’ is what best defines Chennai Superkings. Ravindra Jadeja won the Man-of-the-match award for his 4-for-11 (with an economy rate of 2.75). Earlier, after winning the toss, Rajasthan’s skipper Shane Watson chose to bowl first and put his compatriot David Warner’s eleven to bat. The in-form opener for Hyderabad, David Warner and his partner whose form has been in-and-out so far in this tournament stepped in with high hopes and perfect moustache. An off-spinner, Deepak Hooda was introduced in the very first over of the game. Shane Watson tried the combination of spin and pace with Deepak Hooda, Chris Morris and Dhawal Kulkarni in the initial four overs and he himself came into the attack to deliver the fifth one. Warner hitting hard on the first delivery, sends off the ball out to the fence and with that boundary comes up 400 runs for him in this season of the Indian Premier League. He is still on the second position in the hot pursuit of chasing the Orange-cap. After hitting another boundary in the same over Warner was caught behind by the keeper Sanju Samson off Watson. After a Warner-show of 18-ball-24, Moises Henriques, the only Portuguese in International Cricket came to the crease at number three. A set-partnership between Shikhar Dhawan and Henriques lasted for about five overs and score moved from 1-48 to 89-1, but Henriques was dismissed by 43-year-old Pravin Tambe in the eleventh over. Next, it was England’s middle-order mainstay Eoin Morgan on the crease to bat. After Morgan’s arrival, the momentum at which the runs were coming in. increased drastically. In the fourteenth over, Dhawan hits a fearless six and added another half century in his kitty. But the celebration for him didn’t last for long as he was soon dismissed by James Faulkner. There were two England’s batsmen on the crease after Dhawan left to rest with the blokes sitting in the dug-out as Ravi Bopara was the next man to come onto the crease. Morgan continued his smashing drill by hitting some big shots and left the bowlers of Rajasthan Royals unanswered. But even his innings came to an end when he tried hitting a straight six and the ball fell short of the boundary and went straight into the hands of Steve Smith in Watson’s over. Eoin Morgan’s incredible knock of 63 off just 28 balls helped his team to put a great score of 201/6 on the score board for the opponent to chase. Karun Nair to bat at number four with a great total to chase, felt the pressure from the first ball he faced and failed to manage to stay on the crease for long, caught behind by the keeper and he walked out. After the openers’ failure of performance, the middle order started to collapse. As a partnership was failing to build between the batsmen for long. The Rajasthan Royals’ supporters lost hope , but in the 18th over Sanju Samson with back-to-back two big hits showed a ray of hope that could have ended up shinning brighter than that of the Sunrisers’ bundle of rays. But even he failed and was dismissed by Bhuvaneshwar Kumar’s pace attack on the next ball. Again, a turning point in the game was encountered when Chris Morris came to change the facet of play after hitting three consecutive sixes in the nineteenth over. Only 18 runs needed off the last over. Every Rajasthan supporter wanted Morris to repeat what he did in the previous over but it was the pace of Bhuvaneshwar Kumar that dominated at the end and Sunrisers Hyderabad won a crucial game by 7 runs. A close nail-biting match ended up in Sunrisers’ favor and the Sun was still rising for the Hyderabad, a much needed win for them to stay alive in the tournament. After excelling in all the departments, Bangalore see off George Bailey’s Kings XI. Royal Challengers Bangalore posted another win by hammering Kings XI Punjab brutally at the Chinnaswamy Stadium, move up to third place. Bangalore surged up to the third spot on the points table after posting a total of 226/3 and posted a thrilling victory over the Kings XI Punjab by restricting them to 88 for all out. With the Royal Challengers Bangalore batting first, Chris Gayle and Virat Kohli’s rollicking start led to a 69-ball-119 partnership between the opening duo. 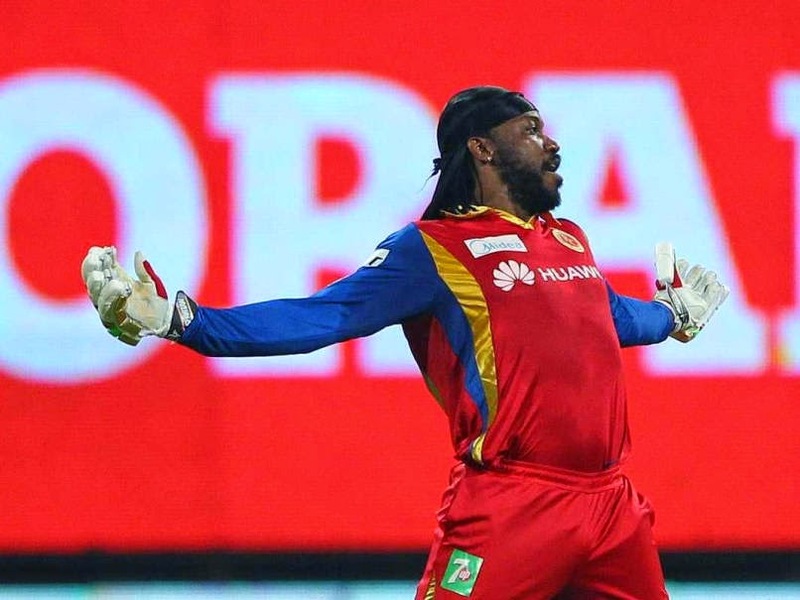 Gayle was as brazen as his approach as he smashed 57-ball-117, while punishing all the bowlers. Skipper Virat Kohli was clean-bowled on a yorker-length delivery by Sandeep Sharma. Kohli was dismissed after scoring 32 runs off 30 balls. After his dismissal, although AB de Villiers smashed 47 runs off just 24 balls and carried on where he left off. Dinesh Karthik(8 off 3) and Sarfaraz Khan(11 off 7) helped Bangalore reach 3-226 off their 20 overs. Bangalore brought in Sreenath Aravind for the first time to strengthen their bowling. He ended up with figures 4-27 while Mitchell Starc’s 4-15 was enough to make Kings XI realise that the damage has been done. Punjab’s batting imploded dramatically to hand over a win to Bangalore. A sensational bowling effort by Royal Challengers Bangalore saw them defend a heavy total as they crushed Kings XI Punjab by a great margin of 138 runs. Such was the dominance of RCB bowlers at the back end of the innings that KXIP lost all their wickets for 88 runs only in the 14th over. Axar Patel’s 40 and Wriddhiman Saha’s 13 runs were the only double-digit runs scored by batsmen from the Kings XI’s side. Maxwell’s poor form continued once again and there was no Miller show for the night. Skipper George Bailey also failed to contribute some runs. “We created a couple of good chances. We have a loyal bunch of fans and we’re letting them down and that’s hard to live with. I guess we talk about looking forward, we had Anureet bowling absolutely superbly, Axar batted well, but we have to put it together. In many cases, I think we’re trying too hard. We’ve talked about getting the enjoyment back in the game. We’ll keep trying,” said Kings XI Punjab skipper George Bailey in the post match interview. Chris Gayle won the Man-of-the-Match trophy for his thundering storm of fours and sixes.